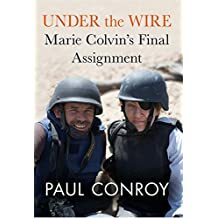 Journalist Marie Colvin (1956-2012) was an American war correspondent who reported on some of the most violent conflicts of our times – in Chechnya, Kosovo, Sierra Leone, Zimbabwe, Sri Lanka, East Timor and Libya. By the time she reported on the Syrian Civil War with photographer Paul Conroy, she had achieved iconic status. Blinded in one eye by a grenade in 2001 in Sri Lanka, she wore an eye patch and had a reputation for courage and fierce, incredible persistence. Her story has been told in books and a movie. Conroy’s account of the Syrian Civil War (from the rebel viewpoint) is hard to read. The statement “war is hell” hardly begins to describe the conditions and suffering Colvin and Conroy saw and ultimately experienced. They escaped from the besieged rebel city of Baba Amr, but returned at Colvin’s insistence. She and a French photographer died there. Conroy escaped a second time, with terrible injuries and severe PTSD. For another look at this book, see this blog entry. The author highlights important aspects of the narrative that I won’t attempt to cover. Why do journalists do expose themselves to such nightmarish danger? Their answer is simple. They do it to bear witness, to see and to tell the terrible story of human suffering and in particular the suffering of non-combatants and the innocent – children in particular. Throughout Conroy’s book runs outrage and the frantic hope that someone is listening, that someone will intervene on behalf of 28,000 civilians trapped in Baba Amr. Less idealistically, war zone journalists are adrenaline freaks, hooked on the chemistry of fear and often on other chemicals as well – alcohol, nicotine, etc. But where would we be without adrenaline freaks? Who would rush into burning buildings or fly into space? I don’t “understand” this behavior, but I respect it. In this blog, dated October 9, 2013, you will find my review of Nicholson Baker’s Human Smoke – The Beginnings of World War II, the End of Civilization. Why does Baker choose that date as the end of civilization? Because it marked the end of a distinction between soldiers and civilians during war. He blames the change on the emergence of aerial bombardment as a primary military tactic. Aerial bombardment was rarely accurate. Accusing the foe of breaking the old “rules of war”, both sides proceeded to bomb cities indiscriminately. The climax was the American destruction of Hiroshima and Nagasaki. This action was NOT unanimously approved by American citizens. The Syrian Civil War may be (almost) over, but peace is not assured and any form of “reconciliation” seems remote. The magnitude of human suffering is staggering. If civilization ended in 1945, what has been going on since then? Civil wars seem more and more common. “Guerrilla” war is a new norm. Wars are no longer declared, and are not fought by countries, but often by “non-state entities”. There’s a great deal of “proxy” behavior. Superpowers are competing for influence and access to resources. The invention, production and distribution of weaponry has become a large and permanent feature of the global economy. What else? I’m not educated enough to take this analysis further. I saw Catch 22 last night at the Curio Theatre in Philadelphia. I read the book 50 years ago. This should explain any incoherence in my comments. The setting is the European theatre of World War II. The characters are members of the Allied military stationed in Italy, and local residents they meet. Joseph Heller, a WWII Air Force bombardier, published the book in 1962 and the theatrical adaptation in 1971. 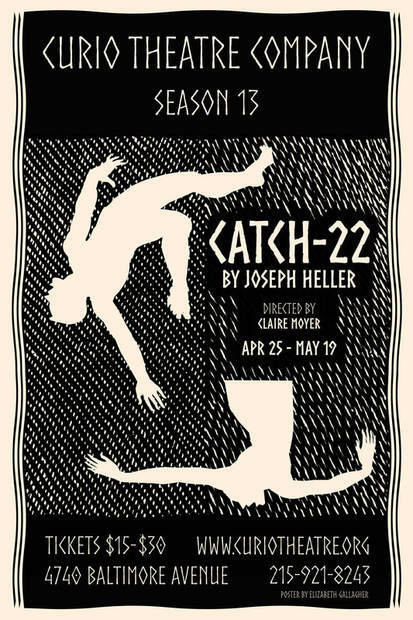 Catch 22 (either way) is black satire – funny but tragic. It deals with war as hell without actually showing the battlefield, while vividly showing the human toll. Catch 22 struck a chord with my generation as we wrestled with the Vietnam “conflict”, the first of our undeclared wars. World War II was fought by a military that relied on draftees, as was Vietnam. The difference is that we won World War II and lost in Vietnam, after which the United States shifted to an “all volunteer” military. World War II is widely featured in fiction. I’ve read some post-Vietnam fiction, but only non-fiction from the more recent wars fought in the Middle East. Every war finds its way into literature. Enough history for now! I was excited and impressed by the Curio Theatre Company. They perform in a renovated church in West Philadelphia, part of a localist movement that goes right down to the street level. (“Localism” is a word. I checked.) The Baltimore Avenue Business Association is a sponsor. The performance space is small and the audience sits on three sides of the stage. Lighting, sets and costumes are entirely professional. It’s an amazing accomplishment! Catch 22 runs until May 19. You can see it! Tickets are available on line. Goodness, I haven’t blogged for many weeks! I’m happy to report that most of this delay resulted from good things happening in my life, like travel. Then there were some troubles, but nothing really far out of the ordinary. BUT also, I read a book that brought me to a bemused halt! Yes, Cryptonomicon. First, it’s huge – 900+ pages. Perfect if you are crossing Siberia by train in winter. (I wasn’t.) And it’s written in a style that mixes fact and fiction, cutting back and forth through time. One message of the book is “war is hell”, to which I reply (as usual) “If so, why wrap it in fiction?” I was somewhat reminded of Catch 22 by Joseph Heller, but that was more linear in narrative style. Why did I keep reading this sprawling, often confusing novel? For the characters and their relationships. And because I’m interested in “contemporary” history, the times I (and my parents) lived through. I have not delved into the reviews of this book. On Amazon.com alone they number 1,685, cumulatively awarding Cryptonomicon 4+ stars out of five. I read (and blogged about) three other books by Neal Stephenson: Anathem, Snow Crash and Seven Eves. Anathem was my favorite, closely followed by Seven Eves. I will await recommendations from friends before I tackle another. Let me make two things clear from the start. I think the Iraq War was a tragic mistake, and I think Presidential Envoy L Paul Bremer made some very bad decisions during his management of the occupation of Iraq. I read this book because of its scale. I’ve thought a good deal about scale lately. Some things scale up or down well. I could give technological examples. But sticking to books, some topics are too big (the meaning of life) and some are too small (what I ate for lunch today). The nature of WAR is something I want to understand, but the topic is too big. This book is about one small aspect of war, one man’s experience in a particular time and place. At this scale, I can learn something. Gallagher was a bodyguard, responsible for the personal safety of Bremer in Iraq after the invasion and before a new civil government was installed. Iraq was unstable and violent, growing worse as the months passed. Gallagher worked for the now infamous contracting company, Blackwater. The use of contractors to do “military” tasks is a relatively new wrinkle, presumably a result of the switch to an all volunteer military. It seems unlikely that any money is saved by the use of contractors, but a different labor pool is activated. Contractors are disparaged by many (especially in the military) for being “mercenaries”. Their relationships to military and government are often strained. Gallagher was hired by Blackwater solely to protect Bremer, originally for a period of just 30 days. He is by no means an apologist for Blackwater. By his standards, the Blackwater managers stateside had no idea what was going on in Iraq or how to protect Bremer. Eventually Gallagher managed a team of three dozen specialists (many formerly in the military) to protect Bremer 24 hours a day. Any notion that the “private sector” always does things better than government is certainly dispelled by this book. Blackwater had its share of pointy headed bureaucrats and sometimes made very strange decisions. Bremer was not an easy man to protect. He left the safety of Baghdad’s “green zone” almost every day, meeting with Iraqi leaders in many different settings. His schedule couldn’t be known accurately in advance. Most of the time, he worked 16 hours a day. As his tenure in Iraq progressed, he was targeted for assassination, and the Iraqi insurgents got better and better at making bombs and organizing attacks. As the man closest to Bremer in public, Gallagher was also an identified target. By dint of very hard work and a certain amount of luck, Gallagher and his team managed to keep Bremer alive, AND avoided any injury or death of civilians. What did I learn from this book? Some people are adrenaline junkies, and the rest of us should be grateful (in most cases) for the work they do. Armed conflict brings out both the best and worst in people. Our governments policies are implemented in ways that can astonish and sometimes disappoint us as citizens. Initially, this book seemed weak, as the author cited other people’s writings so extensively. Gradually, I realized the book was more about peace that about “the Peace Prize”. What is peace? What is a “good” or “necessary” war? How is peace related to pacifism, and militarism, which Alfred Nobel disliked? What did Nobel mean by “militarism”? Why are pacifists so skeptical about defensive weapons? Is all peace good? Is there such a thing as a “bad peace”? Nordlinger quotes (whom? ): “There is no dispute so small it can’t be used as an excuse to go to war. There is no dispute so large it cannot be mediated if that is what the parties want.” Nordlinger doesn’t explicitly discuss the situation when one party wants war and the other doesn’t. Consider the end of apartheid. It could have been a bloodbath… Privilege is never surrendered without struggle, but South Africa made the transition to majority rule without warfare. See my review of Playing the Enemy (October 16, 2013) for one view of this amazing transition and the role played by 1993 Nobel Peace Prize winner Nelson Mandela. Did FW de Klerk, co-winner in 1993, also deserve the prize? Mandela did not think so. What is the role of the nation/state? Nordlinger criticizes the United Nations, which Nobel considered the world’s greatest hope for peace. Published in 2012, this book missed the most appealing Peace Prize winner of all, seventeen year old Malala Yousafzai who was shot in 2012 by Islamic extremists. She is the only citizen of Pakistan to receive the Nobel Peace Prize. This book is so good that I feel I should read it right through again, and take time to investigate and ponder the history that runs through it. It would serve as the backbone for an excellent college course. The Beautiful Things That Heaven Bears by Dinaw Mengestu, 2007. Public debate surrounding immigration is even more heated now than it was in 2007 when this book was published. Mengestu personalizes the immigration “issue”. The narrator is from Ethiopia, and his best friends are from Kenya and Congo. They share a history of violent dislocation. Stephanos, the narrator, owns a struggling store in a struggling Washington DC neighborhood. A woman moves in and renovates a large, once elegant house, and change imposes itself on the community. Stephanos and the woman are mutually attracted, but somehow keep “missing” each other. Loneliness is the theme of this book. This is a well written book. I feel like I got to know some people I’m might otherwise not have encountered. The book seems to also have another title, Children of the Revolution. I found this out from Amazon.com, when I looked to see what else Mengestu wrote. A second book, How to Read the Air, was published in 2010. I hope he keeps writing.